The Tucson Homeskillet: American Flying Buffalo: Your New Food Truck Obsession Starts Here! 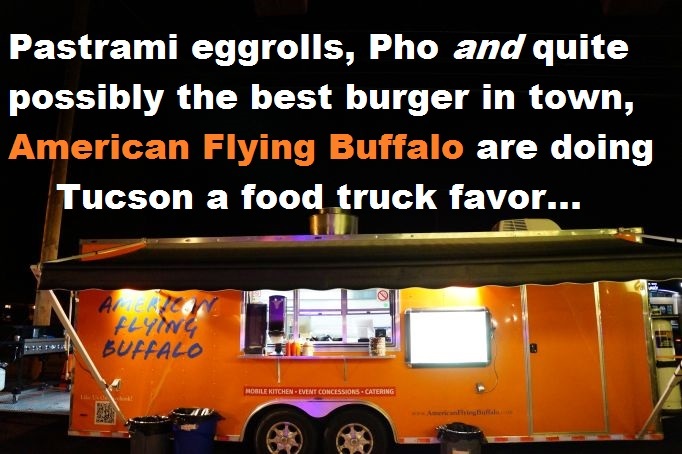 American Flying Buffalo: Your New Food Truck Obsession Starts Here! If we know one thing about food trucks here in Tucson is that if they have a specific dish or style they usually just stick with that. Taco carts sell tacos, hot dogs do hot dogs, crepes are all about crepes...you get the idea. That's normally the norm. But what if I were to tell you about a new truck on the block that is chopping it up and serving up dishes that are as diverse as the heritage of it's chef and owner. I hope you would say, "Bring it on Metal Mark! ", because I know you're cool like that. The man behind the flavor madness is Eddie Bickel, who has been bartending now and then at the Saddlehorn Saloon for quite some time. Thing is, Eddie is a natural cook, always has been, so one day he decided to bring in some homemade wings and serve it up to his bar regulars. Turns out, they were some of the best wings anyone had ever had. His business started to grow at the bar but not just for his drink slinging abilities. People were actually lining up for his food, not just the booze. Since it was always a dream of Eddie's to open up his own restaurant, he gathered up what resources and backing he could and before you know it, he is the proud owner of a bright orange truck to deliver amazing food to the (essentially) good people of Tucson. "I had just won the Best Wings in Tucson from the Easter Seals foundation and was looking to bottle my own sauces", Eddie notes while turning chicken and burgers on his long grill from the back of the truck. "Originally the name started out as Arizona Flying Buffalo with the slogan 'Bring Your Taste To New Heights'! I actually got some product into a few local shops and they did really well. To reach a larger demographic, I changed the name to American Flying Buffalo so I pulled them from the shelves and just decided to open up my own restaurant, which has always been my dream. "I still want my sauces to be in stores but, really, I wanted my own place to get going so people know where it actually comes from." Sure Eddie has amazing wings and incredibly addicting sauces to go with them, but with a full service food truck, it was time to start looking into expanding his culinary horizons. Born in Vietnam to a Vietnamese mother and Dutch/German father, he was exposed to a grand plethora of diverse flavors and dishes from all across the globe seeing as his family was also influenced by French cooking (if you know your history, you know the French had a huge impact on the Vietnamese during their occupancy...oh just read about it HERE) and even American and Mexican cooking as well. Eddie and his "secret burger seasoning"
"Growing up, my mom used to bar-be-que all the time on weekends and everyone would come over to eat," muses Bickel over rising flames from his grill on a drizzly evening in front of Danny's Baboquivari. "Once the marinaded meat hit the grill we could smell it and see the smoke and we'd all come running. Everyone thinks their mom is the best cook but my mom is the best chef ever! "Our dinner table during the holidays was full of everything: turkey, eggrolls, ham, tamales, roast beef, salsa...you name it. I always tease her about teaching her how to cook when in reality she was the one that taught me how to cook." Well all that time with mom really paid off. Eddie and American Flying Buffalo dole out some of the best mobile food fare around. With a sundry of styles and flavors, on any given night you really don't know what the menu might entail. But one thing is for sure, you will always be treated to a huge and delicious burger and a steaming bowl of his signature pho. "It's like what Anthony Bourdain said", Eddie says with a grin, "'I would burn down cities for a great bowl of pho'. Ha! What I love so much about pho is that you can add anything you want in it. My pho comes from an old family recipe and it's just slow slow cooking and you gotta always remember to skim the top." "I have been cooking, seriously, since I was thirteen," informs Eddie after handing out a heaping platter to a happy patron. "I started out as a dishwasher when I was sixteen for a fish fry place in Sierra Vista. But I soon got a line cook job when they saw I had some skills. "Then one day I just had to quit and immediately got a job cooking at a mom and pop burger and beer place which was soon bought out by a enterprising couple. They would come into the restaurant almost everyday and get burgers. They told me it was my secret rub for the meat that kept them coming back. Eventually they cleaned house of all the lackluster employees...everyone but me! That was back in 1987 and for three years straight we won best steakhouse in town. We even won a chili cookoff in Tombstone, one that had almost sixty contestants. From there I went to Phoenix to enroll in culinary school but instead I ended up apprenticing with Chef King at the Phoenix Hilton." Eddie continues as he "beast mode"s his way around the truck, trying to get orders out to chilly and hungry customers. "Around that time my mom opened up a Chinese food restaurant in Bisbee so I moved out there to help her out. For five years straight she won best Asian restaurant. Five years! After she retired I really didn't want to live in Bisbee anymore, so I moved to Tucson where I got a job as a chef at another Hilton, but cooking in hotels was starting to bore me. "So pretty soon I started bartending at the Saddlehorn Saloon for extra cash and for a new challenge, then I started bringing in my wings to the bar and then, well...the rest is history!" All of the combined energies, food factions, locations and methods, really paid off for Eddie seeing as his cuisine has a very distinct rapture to it. The lemongrass chicken is so succulent yet so, lets say, "Tucson-ish". Is that a term? Well, it is now. Enter any Asian eating establishment and you can get, I'm sure, delicious lemongrass chicken, but it might have the same quality and distinction of so many herds of similar eateries. American Flying Buffalo bring a twist and turn to the dish, completely making it their own which is something to be savored and enjoyed to fully understand what you are reading about here. Same goes for the pho. There is a bite and credence to the flavor profiles Eddie creates in a bubble hue of spices and secrets he keeps in a continuum steam brew on the line. The fat noodles, the cilantro, the citrus, the perfectly rare meats, it all comes together in yet another uncommon provision of simple yet wonderful sparks of inspiration and just wanting to get the magic of a real bowl of pho to the headscratchers that might not be convinced of its glorious healing power. No really, on this sputtering rain evening, Eddie's pho somehow made us all feel just a little bit better. Not that we were sick...just better. PS: and it's pronounced FUH, not FO. Just saying. "But what about the burgers? ", you might be asking me. "You said in your header that American Flying Buffalo has some of the best burgers in town. Is this true?" Each one weighs in at a decent half pound; a good n' hearty half pound. I got something called the Mac Daddy, which was loaded with crisp lettuce, tomatoes, onions, thick slab of cheddar cheese and a "secret sauce". Combined with his already special rub, this thing nearly killed me. And, I was alright with that. If I was to enter the kingdom of the otherside, face slathered in burger juice and secret sauce, with tater tot (yes, Eddie serves up tater tots, and fries too but, whatever...tots!) speckles dusting my mouth and beard, I'd do so with a dumb grin and lazy meat soaked gait, totally content. Then the Almighty would look down and ask, "Why are you here so early?" I'd be all, "Fxxk it. American Flying Buffalo dude." Then we'd have a good laugh before going off to see whatever band Cliff Burton had established in the after life. To make matters worse (not really but...well we were already packed in with food), Eddie had a special eggroll going that night, one that he usually changes depending on his mood and what ingredients he can get fresh that day. This time around it was a pastrami Reuben roll. Oh yeah, you heard it right and you heard it right here: eggroll stuffed with my favorite cut of deli meat, topped with provolone cheese, fried to perfection and served with a spicy Russian dressing. If you ever get a chance to eat these things, please do yourself a favor and do so. Check his social media, make sure he's got this going and hunt Eddie down. We had three servings that night. Three. After everything else we ate. Three. "I just love the people's reactions. I love being in the restaurant business! ", beams Eddie as he tosses his famous wings. "No really. Everything from the back of the house to the front. But mostly I love it when people say I just made their tastebuds explode or that they can't get fried rice anywhere else because of me. "People always ask me 'what's my favorite thing to cook?' All I can tell them is that I simply love to cook! Whatever. That's why I don't want to just, say, open up an Italian place because I'd just be cooking Italian food all day. Or a Mexican place, or strictly Asian. Not that there's anything wrong with that but...I just wanna cook what I want to cook. "But running a food truck isn't easy," Eddie confesses. "We have to keep this thing extremely clean and we detail it once a week. Plus having to refuel and all...everything else is awesome. I'm used to working in small spaces so the tightness in here doesn't bother me. I really love the mobility and always serving to a new audience." And Eddie's thoughts on the future of American Flying Buffalo? "I can see us opening up restaurants here in Tucson and elsewhere. That's our dream and goal. I would love to go back to that restaurant in Sierra Vista and just buy it. That's where I met my business partner Bill (Tankesly) where we worked together. It's definitely on our wish list. "Plus I want to get our sauces out there back on the shelves along with our seasonings and dressings. Who knows, maybe I'll write a cookbook someday!" "You know, I would like to say I wish I had more time to bake more." With a belly full of goodness, cooked with love, we headed out into the cold dribble of the night, and all we could do was exhale a delighted breath which caused a rare quick steam cloud in the Tucson air. 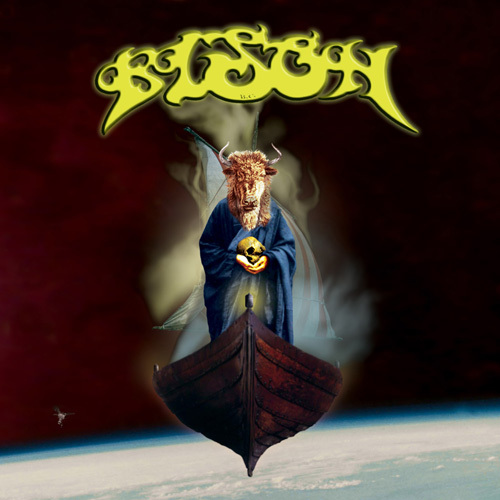 Later, in a beef and pho soaked slumber, I had a dream about a heaven that was lined with bright orange food trucks, manned by heavy metal bassists and serving up vegan sprout patties while blasting Jimmy Buffet records over a sea of cold soup made with the tears of a Nickleback reunion. Nevermind. Eddie's food was worth it.